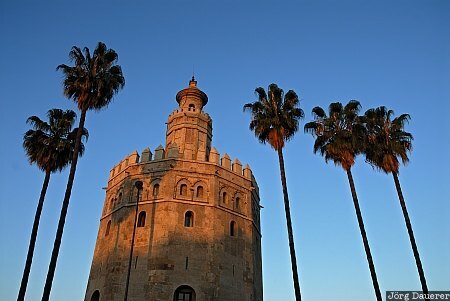 Torre del Oro, one of the landmarks of Seville and palm trees at the banks of Guadalquivir river illuminated by soft morning light, Andalusia, Spain. This photo was taken in the morning of a sunny day in March of 2008. This photo is part of the exhibition Towers (February 2011). This photo was taken with a digital camera.